This week, with the banging and hammering of construction going on next door in our bathroom (we are having the shower replaced after far too long), it seems fitting to make a little noise of my own. I am, therefore, concentrating on crunchy, snappy textures. I am going to make a big batch of croquant – one of the very important textures in creating delicious chocolates. 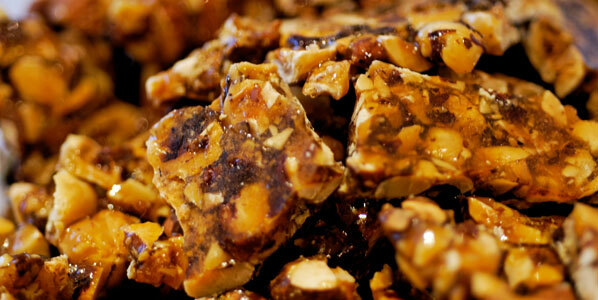 Mmmmmm ….. toffee. 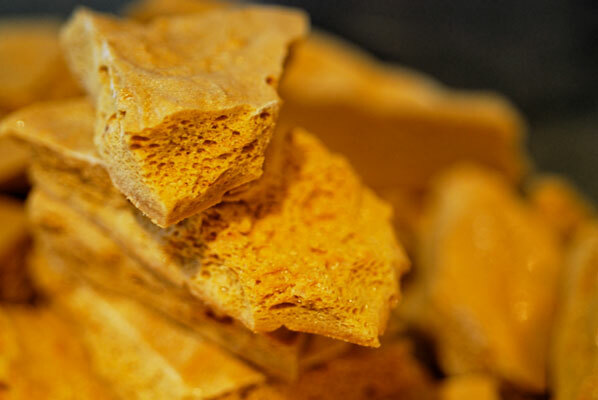 I am excited also, to try my hand at sponge toffee, or sea foam, which is the glorious crunchy centre of a childhood favourite chocolate bar – Cadbury’s Crunchie. 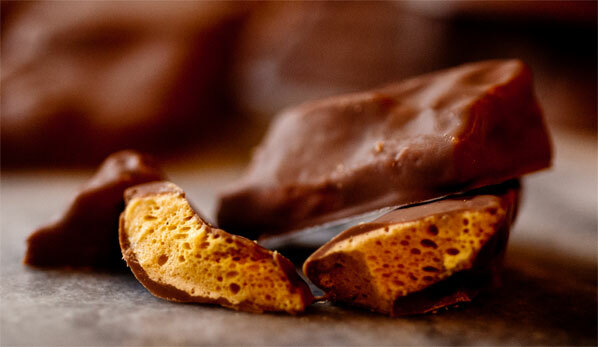 First introduced to the market in 1929, the Crunchie bar gloriously shatters in your mouth and tingles on your tongue, and is coated in milk chocolate. A perfect rectangle of noisy, delicious crunch. When I had the good fortune to visit Australia a few years ago, I was urged by an ex-patriot friend to bring her back a Violet Crumble. Violet Crumbles are crisper in texture than Crunchie bars, with a slightly more marshmallow taste, but also feature the sponge toffee interior and milk chocolate covering. They appear to pre-date the Crunchie, by being first marketed in 1913 by enterprising Australian jam entrepreneur, Abel Hoadley. And so, to work. 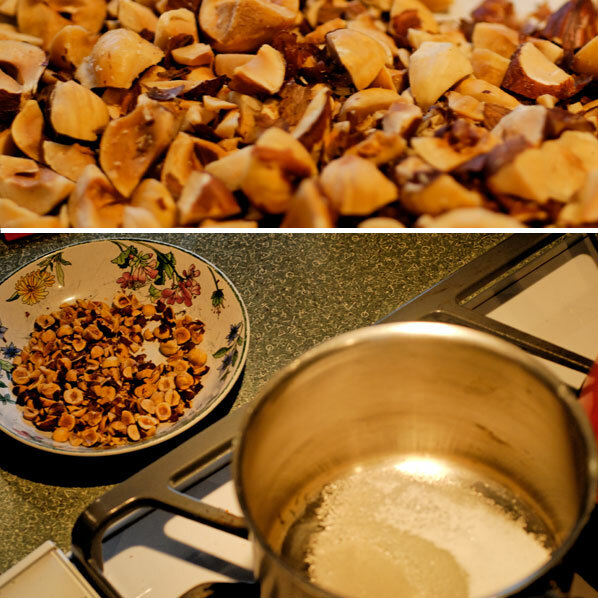 I toast a pan of hazelnuts and one of almonds (even the nut-haters in my family find this smell intoxicating), and while the nuts are still warm, prepare the very simple ingredients – white sugar, and a splash of lemon juice to inhibit the growth of crystals as the sugar caramelizes. 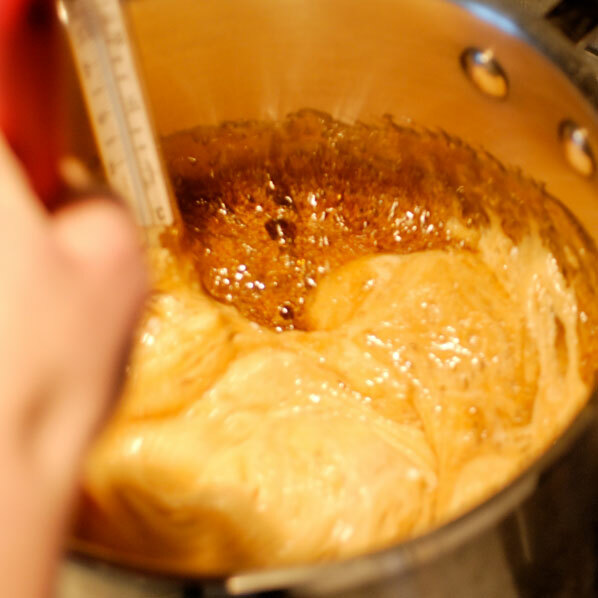 I am learning the importance of not stirring, in caramel making recipes. This has been a tough lesson. I love to stir things – I believe it is an integral part of the meditative act of cooking. It makes me feel a part of the process – like, without my careful combining of ingredients, and deft hand at folding, it would never come together. Perhaps this is a holdover from learning to make an emulsion, which requires beaucoup de stirring. But this is really much more like a science lab. My partner and I observe and note the raw ingredients, the introduction of heat, the almost magical change in colour and consistency, as the sugar melts and transforms from a white crystal to a golden liquid. 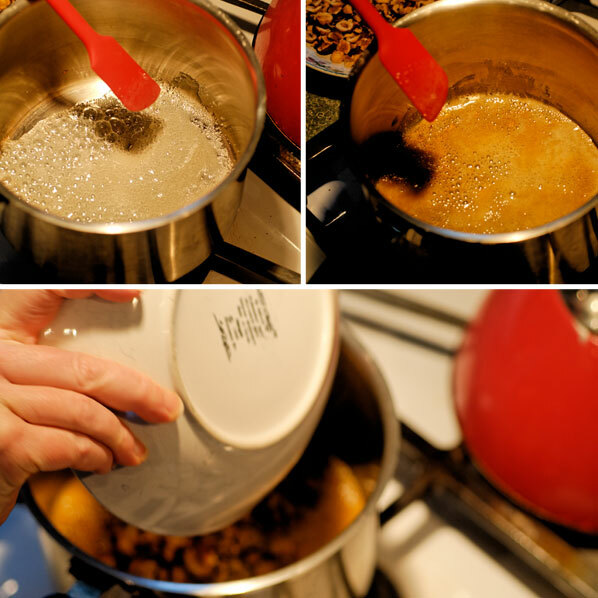 I am not allowed to stir, but I do hover, because the alchemical change happens very quickly, and as soon as the sugar is a golden brown syrup, I must get the warm, toasted nuts stirred into it, before the whole thing is burnt, or stuck to the bottom of the pan. 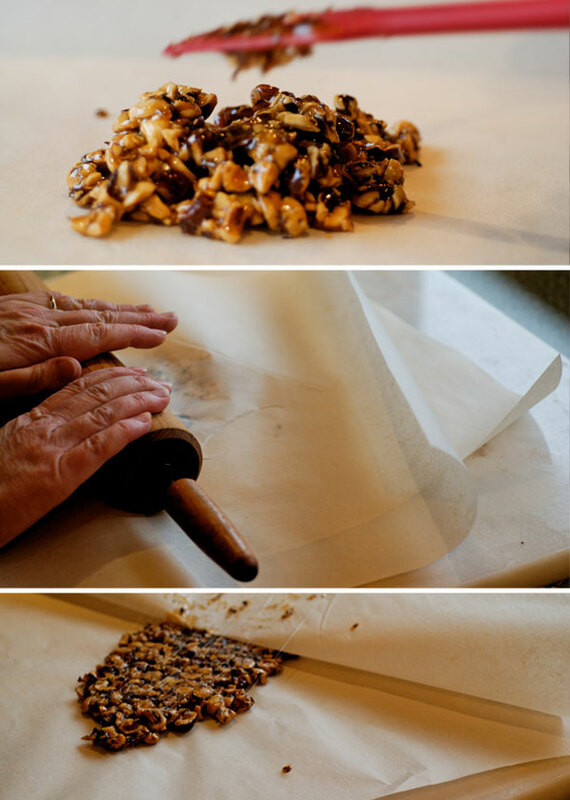 The syrup/nut mass is dumped onto a large piece of parchment paper, another piece slapped on top. The whole thing is quickly flattened and spread with a rolling pin. The parchment is really important, because the mass is adhering to everything it touches, except silicon. I love silicon. And now, with my nut croquant rapidly hardening into a beautiful golden, crunchy sheet, I feel ready for the next lab – sponge toffee. I keep huge bottles of vinegar and copious amounts of baking soda on hand at all times, because the two are such fantastic natural cleaners. Also, when you need to entertain a group of housebound kids, with the addition of red food colouring and a funnel, these two stalwart ingredients make a fantastic erupting volcano. And I cannot wait to try a recipe with the instructions: “Standing back and averting face, whisk in baking soda. 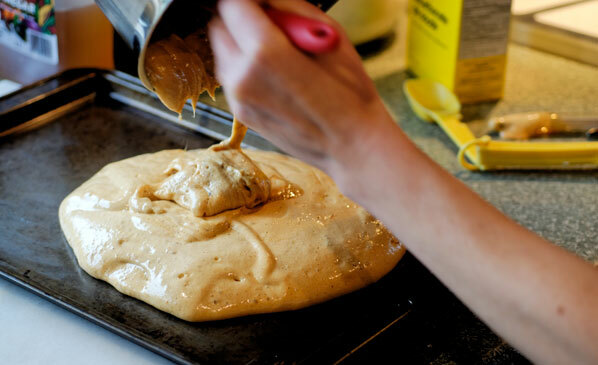 Caramel will bubble and sputter and increase in volume.” – from the Canadian Living test kitchen recipe. Perfect for all the science nerds at our house! However, I prefer the Ecole Chocolat recipe, and I am happy to see that Pam’s instructions/warnings are very similar. Sea Foam, indeed. The carbon dioxide reaction of the vinegar and baking soda makes a fantastic, foamy blob, and I scoop it into a well-buttered pan to cool and harden. How am I ever going to cut it? Apparently, the good people at Cadbury do the cutting using a highly focused jet of oil. I can see what a disaster this would be in our kitchen – although my adventurous family would be completely into it – they are building a functioning trebuchet in our living room, as I write this. There are, also, wonderful huge, vibrating, rolling machines especially designed for cutting croquant and other highly shatter-able centres, available for professional, industry standard kitchens. I like the looks of them. Instead, I settle for cutting my sponge toffee into chunks with a trusty kitchen knife. The family is allowed to sneak the shards as I temper some Callebaut milk chocolate. I needed practice with my dipping forks (even my usually supportive partner says so – but perhaps this is a clever ruse to get himself more chocolate), and the toffee is light and very easy to manipulate, with its rough edges. In no time, I have a Silpat mat full of irregular but tasty homemade sponge toffee chocolate bars, and some aromatic soon-to-be-paired-with-chocolate nut croquant. Mmmmm. What a tough gig this is. And with all these people diligently constructing, hammering drilling and sawing around me, the noise of crunchy centres is a joyful one indeed.